We were bothered by some statements that appear in a recent report ["Fears funding freeze is going too far", Nathan Jeffay - Australian Jewish News, September 20, 2018] that looks at changes in the Trump administration's approach to US support for non-governmental organizations (NGOs). Each of us (Frimet and Arnold) has criticized PCFF's work and methods via articles and posts over a period of 15 years. We have not managed to get much of a response from them in all that time. Arnold wrote a brief comment for The AJN which they published yesterday in their physical edition. If an online version is published, we will add the details in an update to this post. So far, there's none. Nathan Jeffay’s review of US foreign aid cuts ["Fears funding freeze is going too far", September 20, 2018] touches on some of the undoubtedly thorny questions that arise when long-standing funding commitments are suddenly slashed. I have no role in any organization that benefits from US (or any non-Israeli) government funding. And I surely don’t have the responsibility of either defending or attacking what the Trump Administration chooses to do. But like many observers of Palestinian Arab and Israeli societies and their universe of non-governmental organizations (NGOs), I strongly favour transparency, along with critical, frequent and active reassessments of who gets funded by foreign governments. In other words, management that has goals and results in mind. If programs are found to need changing, let the change come. UNRWA, the startlingly unique “refugee” organization, has sought since the late 1940s to perpetuate – but not to solve – the powerlessness and misery of Palestinian Arabs. Anyone familiar with its operations, especially its schooling, understands how much harm flows from institutionalized hypocrisy, embedded ideology - and inertia. Right at the outset, Jeffay’s article quotes one of the central figures in Parents Circle Families Forum (PCFF). Robi Damelin and I have spoken on the same platforms in the past. My wife and I have written critical opinion pieces about PCFF’s work. 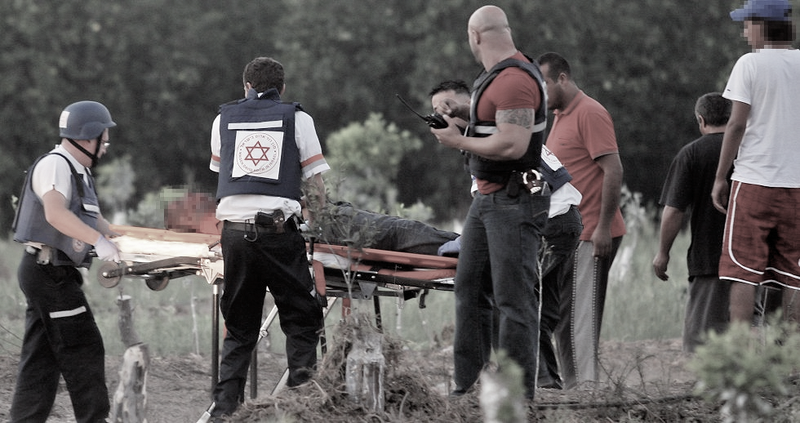 In Israel’s large circle of families bereaved by acts of Arab terror, it’s a small, marginal and noisy participant. That’s an overblown, self-aggrandizing response. 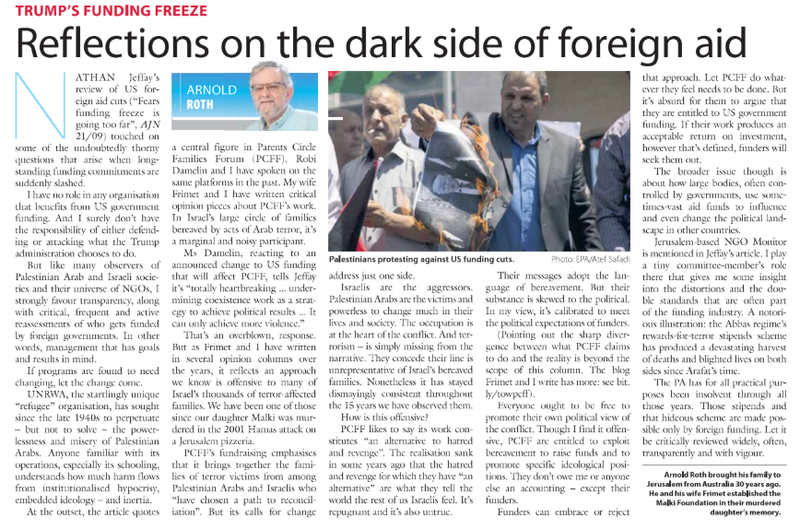 But more than that: as Frimet and I have written in several opinion columns over the years, it reflects an approach we know is offensive to many of Israel’s thousands of terror-affected families. We have been one of those since our daughter Malki was murdered in the 2001 Hamas attack on a Jerusalem pizzeria. PCFF’s fund-raising emphasizes that it brings together the families of terror victims from among Palestinian Arabs and Israelis who “have chosen a path to reconciliation”. But its calls for change address just one side. Israelis are the aggressors. Palestinian Arabs are the victims and powerless to change much in their lives and society. The occupation is at the heart of the conflict. And terrorism – is simply missing from the narrative. They concede their line is unrepresentative of Israel’s bereaved families. Nonetheless it has stayed dismayingly consistent throughout the 15 years we have observed them. How is this offensive? PCFF likes to say its work constitutes “an alternative to hatred and revenge”. The realization sank in some years ago that the hatred and revenge for which they have “an alternative” are what they tell the world the rest of us Israelis feel. It’s repugnant and it’s also untrue. Their messages adopt the language of bereavement. But their substance is skewed to the political. In my view, it’s calibrated to meet the political expectations of funders. Everyone ought to be free to promote their own political view of the conflict. Though I find it offensive, PCFF are entitled to exploit bereavement to raise funds and to promote specific ideological positions. They don’t owe me or anyone else an accounting – except their funders. Funders can embrace or reject that approach. Let PCFF do whatever they feel needs to be done. But it’s absurd for them to argue that they are entitled to US government funding. If their work produces an acceptable return on investment, however that’s defined, funders will seek them out. The broader issue though is about how large bodies, often controlled by governments, use sometimes-vast aid funds to influence and even change the political landscape in other countries. Jerusalem-based NGO Monitor is mentioned in Jeffay’s article. I play a tiny committee-member’s role there that gives me some insight into the distortions and the double standards that are often part of the funding industry. A notorious illustration: the Abbas regime’s rewards-for-terror stipends scheme has produced a devastating harvest of deaths and blighted lives on both sides since Arafat’s time. The PA has for all practical purposes been insolvent through all those years. Those stipends and that hideous scheme are made possible only by foreign funding. Let it be critically reviewed widely, often, transparently and with vigour.